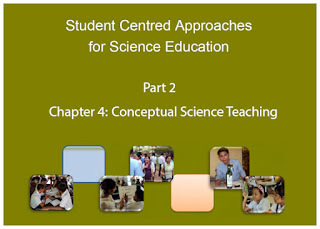 The manual on Student Centred Approaches (SCA) in Science Education has been compiled in order to support science teacher trainers in their teaching. In 6 chapters we present a wide range of tools and techniques to increase the student centred character of science lessons. A student-centred approach means literally that the student is placed in the centre of the learning process. Some characteristics of a student-centred approach include: - Active involvement of the students in the lesson; - Students learn from each other, not only from the teacher. - Students are more responsible for their own learning. - Differences among students are taken into account. The tools and techniques in this manual were first introduced at RTTC Kandal. A team of teacher trainers and teachers tried out the techniques, discarded some and changed others and provided suitable examples from the local curriculum. This manual consists of 6 chapters: Chapter 1: Developing Active Reading and Writing Skills presents techniques to stimulate active and strategic reading and writing skills with students in science lessons. Chapter 2: Developing Reasoning Skills presents discussion and argumentation techniques for science topics. Chapter 3: Teaching the Scientific Method introduces ways to make students familiar with the various stages in the scientific method. Chapter 4: Conceptual Science Teaching focuses on techniques to stimulate conceptual thinking with students. Chapter 5: Models and Analogies introduces techniques and examples of models and analogies in science lessons. Chapter 6: Educational Games explains how to integrate educational games in science lessons and gives a range of examples. We hope that teacher trainers will try out the methods in this manual. We are looking forward to receiving your comments. We wish you an inspiring experience and many satisfying science lessons.